THE ORIGINAL, AND IN OUR CUSTOMERS’ VIEW, THE BEST! BEWARE OF SHODDY, SHODDY COWBOYS…! This is your choice for fabulously fun tours in Ted Country. 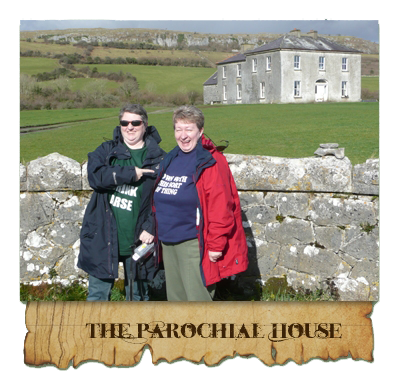 Visit Father Ted locations and the REAL Craggy Island. Follow in the footsteps of Ted, Dougal, Jack and Mrs. Doyle. Drink in their local pubs, have tea & cake with the real Mrs. Doyle. Re-enact “My Lovely Horse”, or even stage a Mobile Mass… any kind of madness is possible! We really are the experts when it comes to all things Ted, with local knowledge beyond belief we can take you to places you never thought existed! Many of our guides have even been involved in the filming of the series! Please note: our tours can only be booked directly with us or via our online booking system: any packages being offered by hotels or other 3rd parties MAY NOT involve a Ted Tour with an experienced guide, so if you are in doubt, give us a call or email us directly. Now have a look at the locations to see where you can visit!